New version convinces with automation and assistant functionalities for an even better ease-of-use of the software. The main new functionalities are the automated distortion compensation, the automated support optimization,the best-fit method as well as the build orientation assistant. Simufact Additive 4 convinces with automatation and assistant functionality for a even better ease-of-use of the software. The most crucial issue in metal AM is the part distortion due to thermal effects. While previous versions of the software only detected the distortion, Simufact Additive is now able to use a powerful automatic compensation in order to reduce such a distortion. This happens through iterative steps until the distortion meets the required geometrical tolerances. This useful and beneficial functionality goes hand in hand with automatic support of the best build orientation and new concepts in support generation. Automatic part distortion compensation with multiple iterative steps. 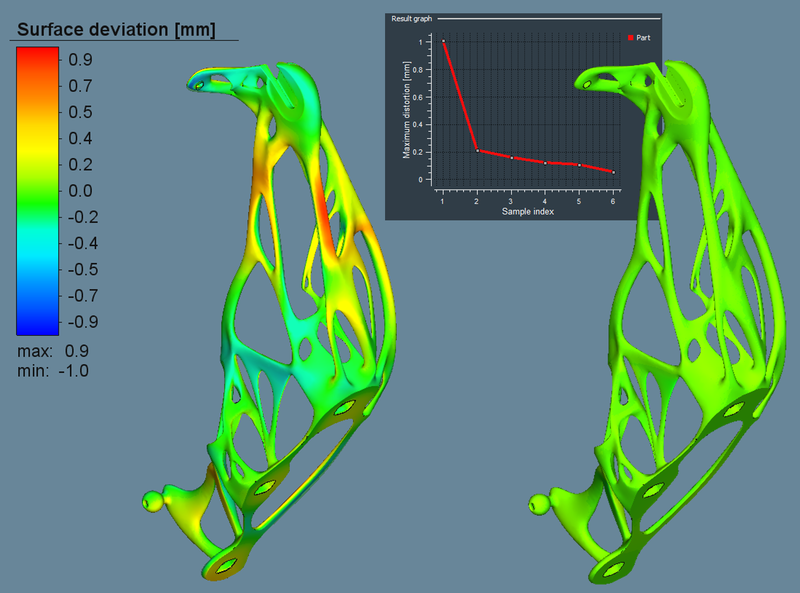 Anotherchallenges of the Additive Manufacturing process is a optimized support structure concept in terms of design, position and quantity. This directly influences productivity and efficiency of the entire process. 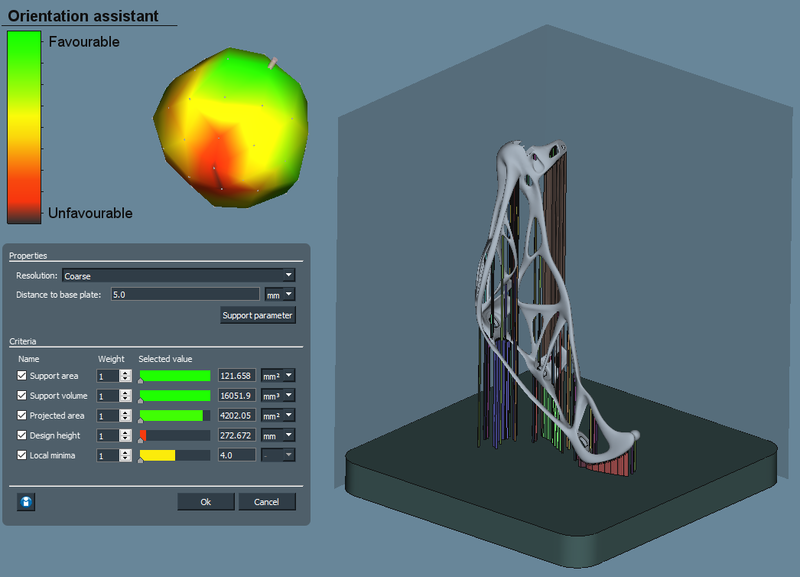 Therefore, Simufact Additive 4 comes with an automated support optimization functionality that automatically determines the optimal setup for the support structures. Not only can the result be utilized to run virtual tests within Simufact Additive based on Simufact support structures but also, a newly implemented function, can be used as the basis for generating Magics supports within Simufact Additive based on Materialise proved technology. Finally, the knowledge and insights gained during the simulation can be transferred to external third party software, such as Materialise Magics, Renishaw’s QuantAM or other 3D printer’s build preparation software. Real 3D print processes are described by rather complex physical boundary conditions. Usually not just one part is printed but several are nested within one build thus parts are influencing each other. With Simufact Additive version 4, the software achieves a next level of precision and realistic modelling. The other exciting functionality for getting more accuracy is the definition of spatially dependent process parameters (inherent strains). This happens based on a new, flexible and powerful concept of data calibration to gather the inherent strain parameters. Predefined or user-defined cantilevers, modelled in arbitrary locations within the build space provide project specific simulation parameter, so that every enterprise can customize its own individual simulation environment. 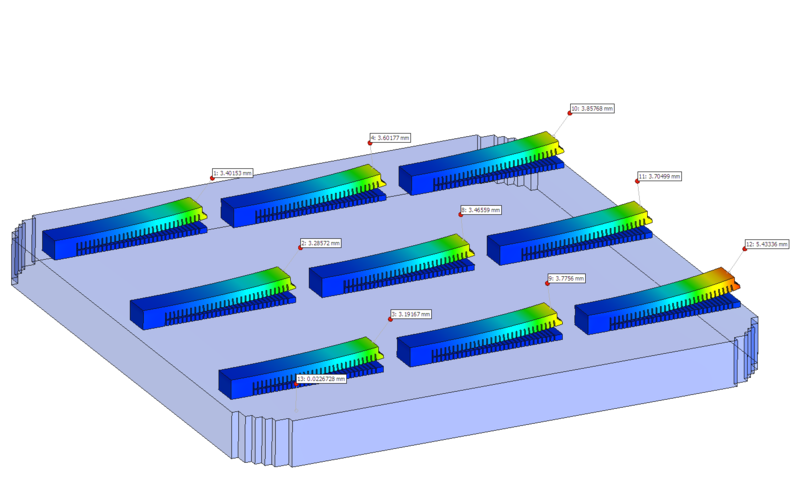 The maximum benefit of any manufacturing process simulation can be achieved with the subsequent analysis of the produced part, e.g. 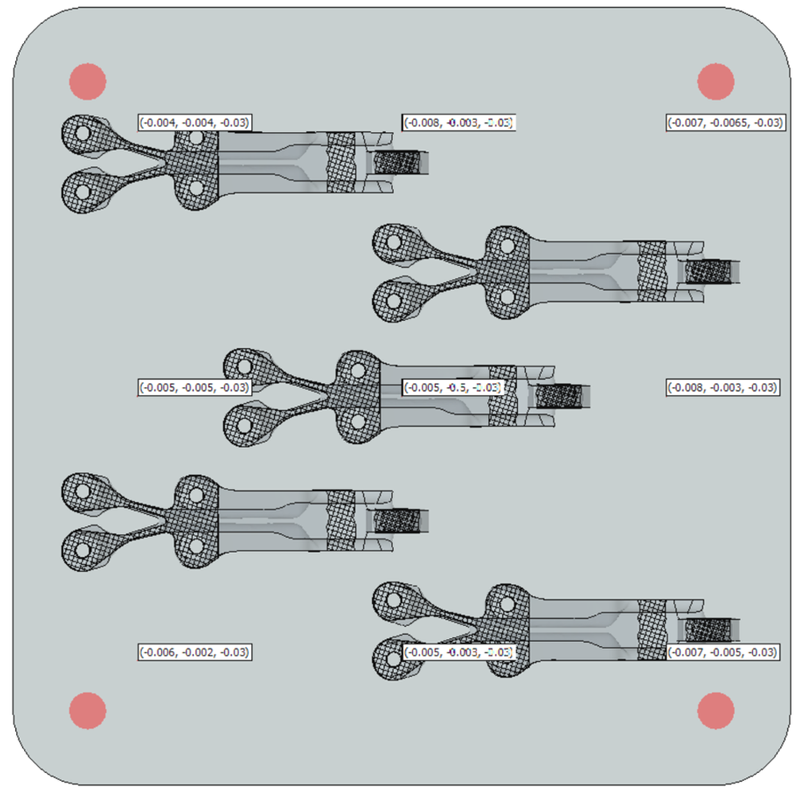 performing structural or lifecycle simulation on the printed part. The quality of those so called part performance analysis is by nature depending on the physical status right after the manufacturing process. 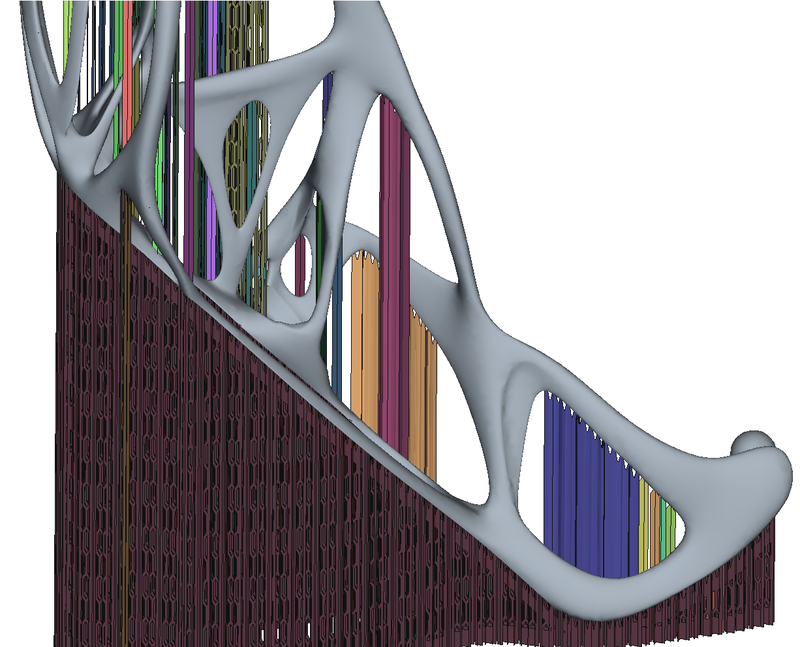 Simufact Additive is now able to connect with third party software, mapping relevant volume parameters and transferring those via a flexible universal file from process simulation to the world of structural analysis. Since the first generation of Simufact Additive, Simufact has been including an interoperability concept for a data exchange to proprietary software of many machine vendors such as Renishaw’s QuantAM and other build preparation software, e.g. Materialise Magics. With the re-worked interoperability concept of the current version Simufact expanded the exchange possibility to additional software solution. A proper calibration is imperative to receive accurate results from the simulation. Essential details and data required for an easier and faster calibration, either mechanical, thermo-mechanical or thermal, are already predefined in the Graphical-User-Interface (GUI) including but not limited to, the single cantilever geometry, uniform and isotropic inherent strains, the measuring point and the cutting stage. From now on, the users will be able to adjust these calibration parameters based on their requirements. Additionally, the users can also calibrate their geometry with regard to the spatially dependent process parameters. The user-defined calibration also allows the importing of customized geometries and inclusion of the base plate during the calibration.